Since its introduction in ’66, the Dodge Charger has endured as one of the most iconic vehicles to have been produced in the last half-century. While not originally conceived as a muscle car (despite the absence of a Hemi option from day-one) the availability of power combined with its sleek fast-back roof-line spoke to a performance mindset, and the rest is history. Through 1974, the Charger would continue to evolve, contributing to the legacy of ‘Detroit Steel’ and America’s fascination with muscle. But eventually, the combination of mid-70’s design trends and late-70’s fuel costs would stronghold the Charger (and its brethren) into less-welcome changes. From 1975 on, it felt less like a sporty muscle car, and more like a great luxury square-bodied sedan. With NASCAR opting to use the earlier model years, the Charger began to feel dated. 1980’s efforts to restore a sporty feel resulted in a subcompact hatchback, moving even further away from the iconography of the ’66-’74 Charger. While only well-financed collectors or those skilled in restoration projects are likely to enjoy ownership of a classic model year, there are other options available for those interested in a used Dodge Charger thanks to its 2006 resurrection. Long-rumored (since the mid-90’s), the ’06 Charger, was unable to retain every design note and feature visualized in the concept cars that graced the floor of various auto shows. However, Dodge got many things right, most notably their modernization of the classic fastback-inspired body style, and evolving performance options. Its enthusiastic reception would even pave the way for a resurrected Challenger, and a revitalization of the segment. This would fuel further evolution throughout the Charger’s 7th generation, beginning with the 2011 model year. While immediate predecessors had been successful in establishing the new Charger as a near-perfect blend of performance and family sedan, Dodge was ready to double-down on style. Understanding the expectations of their customers, the redesign focused on creating an even more aggressive aesthetic, albeit one with aerodynamics and functionality in mind. Accented by more angular headlamps, the Charger’s grille and front fascia had never looked more ‘mean’; and the inclusion of side scoops added a sleek level of contouring to the door panels. Thinning the Charger through the middle added a sense of athleticism and, combined with its front-end styling, lent it an air of primal power, like an animal ready to pounce. And by evoking the ’68-’70 era of the Charger’s classic run, the new Charger would create a rear fascia that would become iconic in its own right. Easily discernible by a spread of LED lighting across the entire width of the trunk, there was no longer any risk of missing Dodge’s sporty intention. This (of course) continued in its available powertrain. 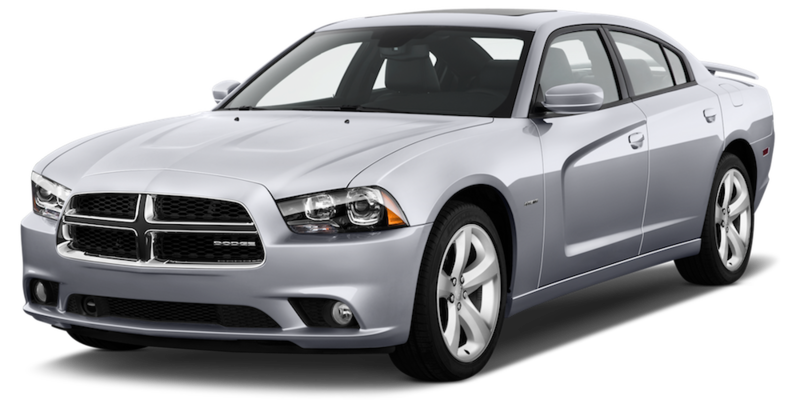 Mated to a five-speed automatic transmission (replacing its four-speed predecessor) the 2011 Charger was powered by a 3.6-liter Pentastar V6. At 292 hp and 260 lb-ft of torque, it represented a welcome 50 point jump in horsepower. And for those looking for pure performance numbers, well, the SRT8 variant had all the power you could handle with a 6.1-liter Hemi that served up 425 hp. That said, the V6 Charger felt like a master class in the balance of conflicting expectations. At 4113 LBS, there was no shortage of beefiness to this Charger, and yet, it had never felt so responsive, sophisticated or (dare we say) nimble (relatively speaking). With a redesigned suspension and a 51.5 / 48.5 weight distribution, the Charger felt well-supported and equally well-balanced. Big? Yes. But like football players performing ballet drills to help with dexterity. This was an all-new Charger. Regarding the interior design, the Charger now showed the visible influence of Fiat, its Italian masters. Both graceful and elegant, this blend of Italian passion and American grit was subtle in its refinement, feeling like an upgrade while reinforcing the Charger’s performance pedigree. Thus far, 2015 has served as a generational tent-pole, seeing as it marks a significant refresh for the 2nd gen Charger. Falling just short of a full redesign, the ’15 Charger displayed an overall shift in aesthetic. With a narrowed grille, headlights and (overall) front end the aim was to create a more aggressive aesthetic. This motif carried over to the rear lamps and fascia as well. While minimizing some of the Charger’s muscular design notes, the changes spoke to athleticism. The interior evolved as well, taking on even more of the Fiat-infused character that helped to differentiate this generation from its immediate predecessor. While the base SE level remained accessibly-priced (starting around $28,990 MSRP) the real news surrounded the release of an earth (and savings) shattering Hellcat V8. Proving that you don’t have to ‘settle’ for a 6.4-liter Hemi that cranks out 485 hp and 475 lb-ft, the Hellcat boasted a 6.2-liter V8. Serving up a staggering 707 hp and 650 lb-ft of torque, it could sprint the quarter-mile in 11 seconds with a top speed of 204 mph. This spirit of the Charger was alive and well. While 2016 and 2017 would introduce evolving touches, there would be little in the way of bold brushstrokes to introduce more substantial change. Sure, enhancement packages like the Blacktop edition would help anyone who wanted to add ‘visual muscle’ without investing in a higher trim level, the Charger continued to take a matter-of-fact approach; in each case, giving you exactly what you pay for. With twelve model years and two generations under its belt, the modern Charger endures with eight core trim levels served, as well as such intoxicating offerings as the SRT 392 and the earth Hellcat. It also boasts one of the highly-regarded infotainment systems around, with the Apple / Android audio-compatible Uconnect 4 system built around a 7-inch touchscreen interface. Combining style, performance amenities and plenty of configurations, it’s hard to argue the continuing appeal of the Dodge Charger. One can only guess where it will go from here in terms of its continued evolution, but kudos to FCA and Dodge for staying true to the Charger’s roots and everything that makes it iconic.